Please refer to our stock # TBD00143 when inquiring. 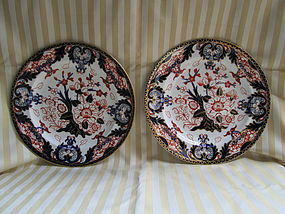 A pair of “King’s pattern” heavy porcelain dinner plates with underglaze blue and overglaze red and gilt decoration. This pattern was an Imari pattern that acquired the “King” name. Both are marked with impressed, “DERBY” under a crown. Both also have red interlaced Ds below a crown. One has the number, “563” below the Ds and the other has a printed mark for the retailer, “John Morlock” of London. These plates are from between 1877 and 1890. The pattern and coloring are the same on both and though the backs are different they are most likely from the same set. Diameter 10 ¼ inches. Condition: no cracks, hairlines or repairs. Both have minor wear to the gilding and overglaze red, with a few small knife scratches. One has a chip on the edge. The red is stencil applied.